What a great NCMA Banquet we had last night. I need to say congratulations to Denny Burrell as our Pavement Champion and Rob Hammond our Combo Car Champion, I had a blast racing you both this year. Andy Gleason earned Rookie of the year and worked hard to make every race this year. My team did a phenomenal job with our new car this year and I need to say thank you to Dwight, Ben and Warren for all of the hard work as we earned 2nd Place over all in the Champion ship. The new Nemesis II makes it's debut at the Boy Scouts 2018 Pinewood Derby! The 2017 season ended with a bang at Ukiah Speedway over the July weekend. Not only did the season end abruptly but Nemesis will never race again. It is sad to see her bent and mangled but she did her job and I walked away with not even a scratch. NCMA is Turning 30 this year! NCMA is excited to be celebrating the 30th season of competition this year. What began in 1987 as an affordable open wheel class that could travel to different tracks, has developed into a very competitive series that saw 5 different winners last season. While the speeds and quality of the equipment has increased each season, the focus on providing a cost effective platform with a dependable tire and engine package has never wavered. This season NCMA is celebrating the drivers, crews and tracks that have played such an important role in the longevity of the series. Planning is under way to have some of the past champions and series drivers featured at key events throughout the year. Look for more details in the next few months. NCMA will begin the season on April 1 at Madera Speedway. 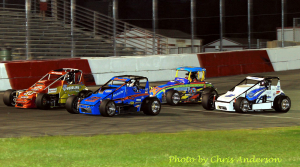 The always entertaining Madera Speedway has hosted some classic NCMA driver battles and 2017 should continue to bring the thrilling tight action that fans have come to expect from the talented field of drivers. Look for NCMA at Madera Speedway, All American Speedway, Lakeport Speedway, Ukiah Speedway and Stockton 99 Speedway in 2017. What an amazing weekend, to battel back from a big crash and win the Main Event is very special. Thank Kevin, Dwight, and Chuck for all the hard work. The NEMESIS Project is complete, the first race out and we take second place. We lead the first 14 laps of the Main Event and finished in 4th place, without any practice. The car was just as fast as the best night with the old car and the new car is only .02 seconds from the lead. So I know you look at the new car and wander what happened to the old one? The story isn’t that long, it’s just not a happy ending. It all started on opening day, we qualified fifth not fast but not slow. With a second place in the heat race we tuned the carb and readied the car for the main event. Starting from the outside pole we took the green. After giving a spot up, we are running in third and running very well. And as in most racing stories it starts with a hit, the first hit was from my left side and the world just started to roll, one, two, and hard on the roof. The sparks were amazing hanging upside down, it just seemed to slide forever and then the second hit was the wall – still upside down. You know it is not the hit, but the sound, It is like a bad movie telling you things will not be ending well for you. It is always the sudden stop that gets you. When the EMTs look very surprised you don’t have a scratch, you know the car did its job. It must have been some show! I must say, I have never seen sparks like that! OK now we get up to today, it is a new start, a new car. We need a name for her – I was thinking of NEMESIS. What do you think of NEMESIS? NCMA 2014 Combo Car CHAMPION! !